The Fragile Peace Of An Iraqi City Once Run By ISIS : Parallels ISIS has been driven out of Tikrit and most residents have returned. But armed Shiite groups are becoming entrenched in the Sunni city, an arrangement that's led to trouble elsewhere in Iraq. A Shiite militia fighter stands in front of a damaged building in Tikrit, Iraq, in April, just days after Islamic State fighters were driven out. Many of the city's Sunni residents have now returned, but the armed Shiite groups remain. For now, the Sunnis and Shiites are mostly getting along. Informal Shiite forces, who had fought alongside the Iraqi army, hoisted their flags in the city center, just a smidgen higher than the Iraqi flag. It was an open question whether Sunni Muslims, who accounted for the vast majority of the city's population, would be willing or able to come home. In several places in Iraq, Shiite forces known as the Popular Mobilization had helped oust the Sunni fighters of ISIS. And in each place there were reports of mass destruction, and of Shiite fighters preventing Sunnis from returning to their homes. But on a recent visit, it seemed Tikrit had confounded expectations. The city center is bustling with life. A central market is full of food and clothes, with families shopping busily. The signs of war are everywhere – one shop had a row of shirts hanging up from a charred beam. Residents say there's now some electricity and water, some schools are open and the security is, by Iraqi standards, decent. The main market in Tikrit is bustling despite damage from months of occupation by ISIS and battles to push the extremists out. "As long as the Iraqi security forces are here, I feel safe," says Masoud al-Hamoud, a pharmacist whose shelves were neatly stacked with perfumes and soaps. The flags of the Shiite groups, with their red, yellow and green symbols and slogans, are still all over the city, though. 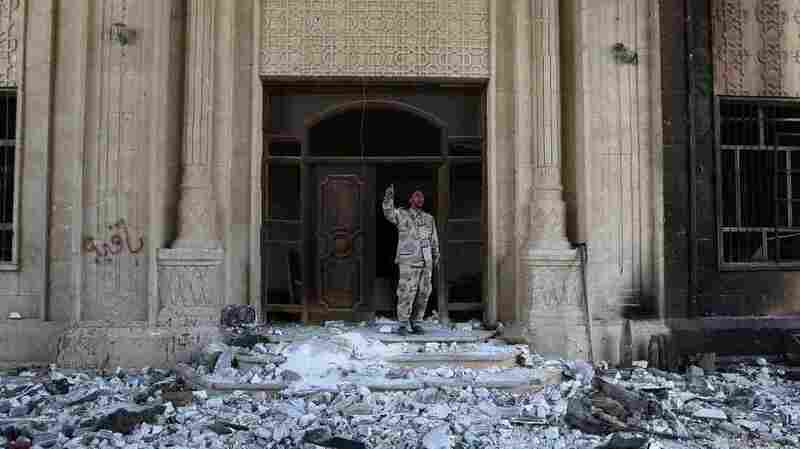 And the Shiite forces still control a huge palace compound that dates to Saddam Hussein's time. The former Iraqi dictator was from Tikrit and bestowed favors on his city before he was ousted in 2003. Sheikh Jassim al-Jabara, the head of the provincial council's security committee, is Sunni. Like many Sunnis in Iraq, he fought against the Sunni extremists of ISIS and he says he was glad to have the help of the Shiite fighters of the Popular Mobilization, a movement that began in 2014 as a volunteer force when Shiite leader Ayatollah Ali al-Sistani called for resistance against ISIS. "There are many people living in Tikrit now," Jabara says proudly, "and life is better than it was before ISIS came." 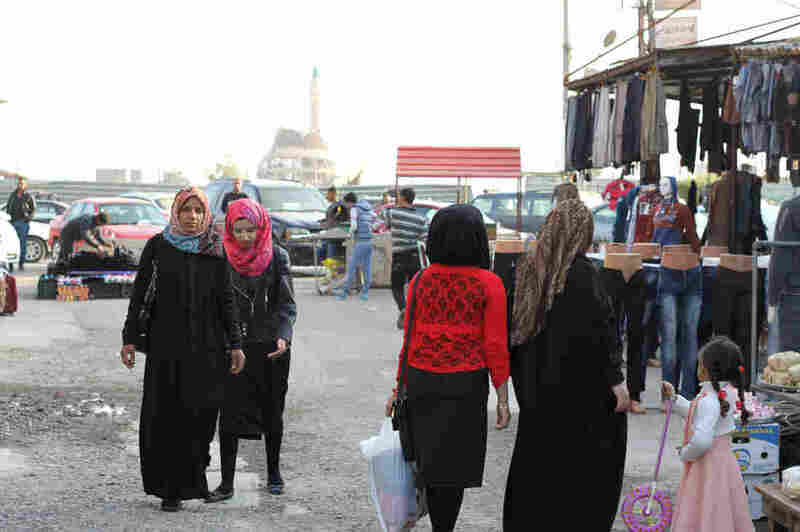 Estimates on the number of returnees vary from about 70 percent to as much as 90 percent of Tikrit's inhabitants, who numbered more than 200,000 before the fighting began. Jabara says the Shiite forces have helped bolster local Sunni forces that now number in the thousands. The presence of this Sunni force is designed to reassure people that they won't be targeted for their sect. And, he says, "of course, [the Shiite forces] won't be here forever." He acknowledges there have been a few problems with the Shiite forces, but says they are relatively rare. "You can count them on your fingers," he says. After the city was retaken, rights groups and residents accused some of the Shiite groups of abducting young men and looting houses. Off the record, several residents and provincial officials say there are occasional instances of kidnapping and theft. Some people suspected of collaborating with ISIS while the group occupied Tikrit, or having family members who did, aren't allowed back to their homes. There are other worrying signs that the reconciliation between Iraq's Sunni minority and Shiite majority remains elusive. In Salahaddin, the province of which Tikrit is the capital, officials say there are about 120,000 Sunnis not allowed back to the Shiite areas where their homes are. There's an elaborate, though not yet complete plan for tribal compensation to those who lost families and property when ISIS was in control. However, it would only benefit Shiite tribes, although many Sunnis were targeted by ISIS too. Moeen al-Kadhimi, a leader of the Badr organization, one of the largest of the Shiite Popular Mobilization forces, said his men are needed in Tikrit. He said their role is not just to retake cities from ISIS, but to hold them too. Iraqi government reports found the weakness of the Iraqi army was in large part responsible for the huge gains ISIS made in 2014. "The Iraqi army cannot hold the ground," Kadhimi said in an interview in Baghdad. "We are afraid that if we leave, the army might retreat as they have before, and ISIS could come back." He added that the presidential compound in Tikrit was used as a mass grave for some of more than 1,500 military cadets killed by ISIS at the Speicher Air Base in June 2014. A survivor of that event previously told NPR that some local people participated in the killing, and that only Shiites were killed. The event is seared into the memory of Iraq's Shiites. "We need to protect the site as a crime scene investigation," said Kadhimi. "Because of the size of the tragedy, we will not let it go." The U.S. has condemned several of the Shiite groups. Some, like Kataib Hezbollah, are even classified as terrorists. They are backed by Iran. The head of the provincial council of Salahaddin, Ahmed al Kareem, a Sunni, is pragmatic, rather than thrilled, about the presence of Shiite fighters in Tikrit. He says they were needed to get rid of ISIS. He even suggests that if the U.S. didn't want the Iranian-backed forces to gain ground, there should have been stronger American involvement in the fight against ISIS. "The coalition forces were not serious in helping us liberate our cities," he said. "So it opened the gap for Iranian interference in Iraq." When he sees advisers from Iran on the battlefield, he shakes their hands, because they're fighting against ISIS and that means his people can go home.